It took me a while to consider, whether I was going to buy this book or not. I read and re-read the back cover; as if to find the assurance that I would enjoy a good book. But each time, I put it down. After paid for the 3 other books, I walked out from the bookstore just to come back and took this book to the cashier. I felt satisfied with my decision. I felt even better when I finished reading this book. 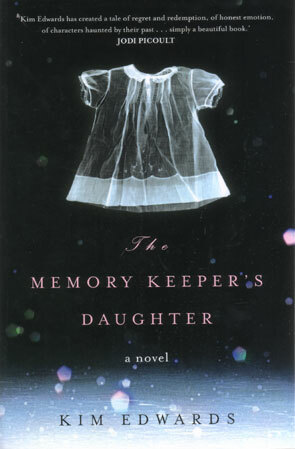 The Memory Keeper’s Daughter took a setting in Lexington, Kentucky and Pittsburgh on 1964 until 1989. The story is quite long, as you can see in the thickness, but Kim Edwards wrote it in a beautiful way of story telling. She would not bore the readers. This book is full with complexity, yet Kim could bring the message clearly to the readers. For a first novel, this book could have appraisal from the readers. One main reason of why I like this book is because David Henry. A young doctor with secrets beneath his skin. Secrets from his past and his present. It follows him everyday of his life. One big decision that he made on the day his twin babies were born, would make his life change forever. That night, his wife, Norah Henry, gave birth to two babies, Paul and Phoebe. David felt a surge of happiness when he took Paul on his hands. He was a beautiful baby boy. But when he held Phoebe on his hands afterwards, he felt numb. He could not believe his own eyes, for he saw a baby with Down syndrome. That day the issue of special needs children had no attentions like today. So, as the reader, I can feel how David felt at that moment. He felt rejected by the world. He already had his own pain from his previous family experience, and now he has to deal with another bigger pain. He gave up. Not just giving up his own spirit, but he also gave up the baby to someone else. For a while, he thought that he made the right decision. But then he realized that his life has been change since then. He had to hide everything from his wife and his son. He had to be a strong man who can protect his family, because he thought that he had failed his parents before. His sister died because they did not have enough money to get the best treatment. They could not afford it. Meanwhile at the same time, David got a full scholarship in Medical faculty. Part of him held that guilty feeling, because he had to leave his family in order to gain his degree and his future. Other part of him, felt that he had to leave because he wanted to help others, especially the poor, once he becomes a doctor. His family life changed drastically, because Norah could not handle her own feeling. Somehow, she could feel that Phoebe did not pass away, that she was around and live. She could sense that David hid something from her. But she could not be certain about what kind of secrets that he held for himself. David had to act like everything is under control, even though his decision really hit him hard. He kept on sending money to the woman who took care of Phoebe as a way to pay for his mistakes. David’s decision to keep everything for himself, bring him even deeper into his own world. Therefore, he believes that everyone is an isolated universe. Each of us holds our own secrets. It can be dark and hollow. It can be painful. It can be too hard to handle. But still, we have to live with that. He had to live with the facts that Norah was having an affair. He had to face the truth that Phoebe will never call him ‘Daddy’. He had to live with the fact that Paul was no longer a Daddy boy. Everything changed in front of his eyes. Even though it was hard on him, he kept on moving forward. He kept on doing his usual business until he passed away. What will happen to Norah once David died? Will she ever find out the truth? Will she be able to face it? What will happen to Phoebe? Will she be okay? How about Paul? How does he feel when he meets Phoebe? I think you should read this book for yourself. It’s worth it.